In this report we present seismicity at Maderas from 1998 through 2011, highlight the 2005 earthquake swarm, describe the "Tomography Under Costa Rica and Nicaragua" (TUCAN) Broadband Seismometer Experiment and the subsequent analysis of an Mw 6.3 event also from 2005, and summarize results from fieldwork conducted in 2009 with new age dates from Kapelancyzk and others (2012). The 2009 field investigation also characterized two distinct phases of volcanism at Maderas, as recent as the Upper Pleistocene (70.4 ± 6.1 ka before present). Despite this interval without documented eruptions, it is plausible that the volcano could erupt again, but risk of a future eruption from Maderas is considered low (Kapelancyzk, 2011). More likely are hazards associated with non-eruptive processes such as seismically triggered mass wasting and gas emissions. A deadly lahar in 1996 (BGVN 21:09) emphasized that non-eruptive processes still offer considerable hazards and justify efforts to watch for and catalog non-eruptive events. Maderas and Concepción volcanoes sit at opposite ends of the dumbbell-shaped Ometepe Island (figure 1). The population on the island is estimated at 30,000 however seasonal tourism increases that number during the year. These volcanoes are monitored by the Instituto Nicaragüense de Estudios Territoriales (INETER) with seismic stations and regular field investigations by staff volcanologists. Figure 1. This map of Central America focuses on Maderas volcano; the inset zooms in on Lake Nicaragua and Ometepe Island. Dashed lines represent the large-scale geologic features, the Nicaraguan depression (ND) to the S and the Median Trough (MT) to the N; triangles represent volcanic centers (Kapelanczyk and others, 2012). Seismicity. One seismic station is located on Ometepe Island within a network of ~32 stations in Nicaragua. From 1998 to 2011, INETER reported that seismicity was irregular although in most years, they located fewer than four earthquakes (table 1). Earthquakes were frequently ML < 3.5 (ML= Local earthquake magnitude) with focal depths ranging between the surface and 179 km. Table 1. Earthquakes located near Maderas volcano from 1998 through 2011. For each year, the table also lists the range of the earthquakes' local magnitudes (ML), the range of their focal depths, and their average focal depths. INETER did not comment on earthquakes that were anomalously deep (e.g. 179 km below sea level). Courtesy of INETER. During 2005, INETER's network registered a total of 2,785 earthquakes throughout Nicaragua; 2,629 of these events were located by seismologists, 78 caused shaking that was strong enough to be reported by local populations, and 406 were located near Maderas volcano. Many of these events were located beneath Lake Nicaragua and S of Maderas volcano (figure 2). According to an interview presented in a La Prensa news article, 71% of the events were attributed to strain release along the subduction zone while 27% were associated with the volcanic chain. INETER reported that a significant number of earthquakes also occurred offshore in the Pacific Ocean with magnitudes greater than 5.0. Figure 2. (Left) A map of epicenters for the entire year of 2005 plotted for Nicaragua and the surrounding region. (Right) A map of epicenters for the month of September 2005 plotted for the Lake Nicaragua region. On both maps, note the concentration of epicenters around Maderas at the SE portion of Ometepe Island. Courtesy of INETER. Large regional earthquake. In their monthly bulletins, INETER reported that the earthquake swarm from August through September 2005 included an ML 5.7 earthquake that occurred on 3 August. The USGS National Earthquake Information Center reported this event as Ms 6.2 (Ms = surface-wave magnitude). This earthquake was located ~15 km S of Maderas volcano (figure 3) and INETER reported that many homes on Ometepe Island were destroyed. Shaking was felt by local residents on the Pacific coast of Nicaragua as well as the interior of the country and in Costa Rica. INETER noted that this was the first time in memory that an event of this magnitude occurred near Maderas. Aftershocks continued for several weeks after the event (La Prensa). Figure 3. Map views of initial (left) and double-difference (right) relocated hypocenters. The green and red stars correspond to the Mw 5.3 and 6.3 fore and main shock, respectively (Mw = moment magnitude). The initial hypocenters were cataloged by INETER except for the main shock, which was located separately using TUCAN P and S phase data (horizontal plane 95% confidence ellipse shown). The red inverted triangle represents the INETER catalog location of the main shock. Note that contour intervals are inconsistent with those elsewhere in the literature. Map is modified from French and others (2010). This major seismic event was also captured by the "Tomography Under Costa Rica and Nicaragua" (TUCAN) Broadband Seismometer Experiment. This array of instruments was in the field from July 2004 to March 2006 (French and others, 2010). Project collaborators conducted a relocation and directivity analysis based on data from 16 of the 48 TUCAN stations. They determined the rupture was on a vertical, N60°E striking main shock plane; a secondary fault, with a strike of N350°E-N355°E, was also activated during the 5 hours following the main event. The seismic analysis provided important insight into the regional tectonic setting while also characterizing activity that was independent from the coincident volcanism at Concepción Volcano. Just six days prior to the 3 August 2005 Mw 6.3 event, INETER reported high local seismicity and an ash explosion from Concepción (BGVN 30:07). Explosive activity had begun on 28 July but they lacked any other local diagnostic signatures at Maderas or Concepción related to the Mw 6.3 event. French and others (2010) conclude that "the eruption was not triggered at short time scales by stress transfer from slip on this fault. No earthquakes in [the] analysis relocated beneath Concepción either before or after the eruption." These were also significant findings as they correlate well with the larger interpretation of the region's tectonic setting, supporting the "bookshelf model" (LaFemina and others, 2002). This model addresses the complexities of Nicaragua's deforming tectonic blocks that include clockwise rotation and slip on NE-striking left-lateral faults. Volcanic history. In 2009, field investigations by Michigan Technological University student Lara Kapelanczyk yielded new age dates and geologic mapping for Maderas. Previous investigators had characterized Maderas as a small-volume (~30 km3) stratovolcano (Carr and others, 2007), lacking historic volcanic activity (Borgia and others, 2000), and having unique structural characteristics variously attributed to gravitational spreading (van Wyk de Vries and Borgia, 1996) and localized faulting (Mathieu and others, 2011). Geologic mapping and rock sampling during field campaigns in 2009 contributed to new insight about the eruptive history of Maderas as well as the geologic hazards of the area. Geomorphologic characteristics also distinguish Maderas as an older volcanic site compared to its frequently active neighbor, Concepción (figure 4). Satellite remote sensing also distinguishes deep ravines that cut through the edifice of Maderas, features that suggest long-term, uninterrupted erosion. As recent as March 2010 (BGVN 36:10), Concepción has erupted ash and tephra. Figure 4. A view across Lake Nicaragua in March 2010 toward the twin volcanoes on Ometepe Island, Concepción (left) and Maderas (right). Intermittent ash explosions characterized Concepción's activity in 2010. In this view, a diffuse ash plume covered Concepción's summit and was dissipating at a low altitude, spreading toward the shoreline. Courtesy of Lara Kapelanczyk, Michigan Technological University. Geochemical data and 40Ar/39Ar dating determined that Maderas is an andesitic volcano with lava flows dating from 179.2 ± 16.4 ka to 70.4 ± 6.1 ka. These ages are significant in that, for the first time, quantitative data shows that Maderas has not been active for tens of thousands of years. Kapelanczyk (2011) concluded that, during its lifespan, edifice construction at Maderas was marked by fault displacements that cross the major sectors of the volcano (figure 5). These major events led to the formation of a central graben and distinguish two phases of activity at Maderas: cone growth with pre-graben lava flows and post-graben lava flows. Pre-graben activity included the formation of a lateral vent and two littoral maars to the NE while post-graben activity included a lateral vent to the NW. Maar structures were also described in this research as well as structural information about the summit crater which includes a small lake, Laguna de Maderas (figure 6). Figure 5. Geologic map of Maderas volcano (Kapelancyzk and others, 2012). Note the normal faults (heavy black lines) bounding the NNW-trending graben crossing the structure, an extension of the San Ramon fault zone (Funk and others, 2009). Pre- and post-graben lithologies and structures were recognized by Kapelancyzk (2011). Laguna de Maderas appears as the gray area within the summit crater. Figure 6. View inside of the Maderas summit crater looking SE toward Laguna de Maderas, the summit crater lake. Courtesy of Lara Kapelanczyk, Michigan Technological University. Based on the new information about Maderas's volcanic history, the risk associated with eruptions is considered low (Kapelanczyk, 2011). However, geophysical monitoring is important due to processes such as occasional, significant earthquakes and the potential for debris flows on the steep flanks. In 1996 a deadly lahar occurred on the E flank (BGVN 21:09). This event was triggered during a heavy rainstorm and released a significant volume of material, enough to destroy the town of El Corozal and other settlements nearby. Deep, steep-sided ravines have cut through the slopes, especially on the lower NE and SW flanks (figure 7). Figure 7. This satellite image of Ometepe Island was processed by GVP using near-, mid-infrared, and infrared bands (4,5,7). Water-poor soils appear cyan; brown-to-red areas indicate moist soils; water is black. A small pond is located within the circular crater of Maderas (Laguna de Maderas) and deep erosional features radiate from the summit, distinguishing the relatively older edifice from the neighboring volcano, Concepción. Recent lava flows on Concepción appear black/blue and have distinctive terminal lobes. Landsat acquired this ETM+ image on 27 January 2000 (NASA Landsat Program, 2003). References. Borgia, A., Delaney, P.T. and Denlinger, R.P., 2000. Spreading volcanoes. Annual Review of Earth and Planetary Sciences, 28, 539-570. Carr, M.J., Saginor, I., Alvarado, G.E., Bolge, L.L., Lindsay, F.N., Milidakis, K., Turrin, B.D., Feigenson, M.D. and Swisher, C.C., 2007. Element fluxes from the volcanic front of Nicaragua and Costa Rica. Geochemistry, Geophysics, Geosystems (G3), 8, 6. French, S.W., Warren, L.M., Fischer, K.M., Abers, G.A., Strauch, W., Protti, J.M., and Gonzalez, V., 2010. Constraints on upper plate deformation in the Nicaraguan subduction zone from earthquake relocation and directivity analysis, Geochemistry, Geophysics, Geosystems (G3), 11, 3. Funk, J., Mann, P., McIntosh, K., and Stephens, J., 2009. Cenozoic tectonics of the Nicaraguan depression, Nicaragua, and Median Trough, El Salvador, based on seismic-reflection profiling and remote-sensing data, GSA Bulletin 121, 11-12, 1491-1521. Kapelanczyk, L.N., 2011. An eruptive history of Maderas Volcano using new 40Ar/39Ar ages and geochemical analyses [Master's thesis]: Houghton, MI, Michigan Technological University, 118 p.
Kapelanczyk, L.N., Rose, W.I., and Jicha, B.R., 2012. An eruptive history of Maderas volcano using new 40Ar/39Ar ages and geochemical analyses. Bulletin of Volcanology, In Review. LaFemina, P.C., Dixon, T.H., and Strauch, W., 2002. Bookshelf faulting in Nicaragua, Geology, 30, 751-754. Mathieu, L., van Wyk de Vries, B., Pilato, M. and Troll, V.R., 2011. The interaction between volcanoes and strike-slip, transtensional and transpressional fault zones: Analogue models and natural examples. Journal of Structural Geology, 33, 898-906. NASA Landsat Program, 2003, Landsat ETM+ scene 7dx20000127, SLC-Off, USGS, Sioux Falls, Jan. 27, 2000.
van Wyk de Vries, B. and Borgia, A., 1996. The role of basement in volcano deformation. Geological Society Special Publication, 110, 95-110. Information Contacts: Instituto Nicaragüense de Estudios Territoriales (INETER), Apartado Postal 2110, Managua, Nicaragua (URL: http://www.ineter.gob.ni/); Global Land Cover Facility (URL: http:// http://www.glcf.umiacs.umd.edu/); National Earthquake Information Center (NEIC), US Geological Survey, Geologic Hazards Team Office, Colorado School of Mines, 1711 Illinois St., Golden, CO 80401, USA (URL: https://earthquake.usgs.gov/); La Prensa (URL: http://archivo.laprensa.com.ni). The Global Volcanism Program has no Weekly Reports available for Maderas. During the night of 27 September, a lahar triggered by unusually heavy rainfalls occurred on the E flank of Maderas and destroyed the village of El Corozal (~3 km from the volcano) and other settlements. Five children and an adult were killed, and several more people injured. The full extent of the damage became evident only after a few days: rocks, mud, and water had destroyed 36 houses and heavily damaged crops; some areas were covered with 2 m of mud and water. About 250 people were affected by the lahar and evacuated to a local school. Two policemen, who climbed the volcano two days after the lahar, observed a small crater at the starting point of the lahar. They presumed that a minor volcanic explosion could have triggered the event, but this has not been confirmed by Nicaraguan volcanologists. A local farmer reported a strange thunder sound minutes before the lahar came down. Information Contacts: Wilfried Strauch, Instituto Nicaraguense de Estudios Territoriales (INETER), Dept. of Geophysics, Managua, Nicaragua. Volcán Maderas is a roughly conical stratovolcano that forms the SE end of the dumbbell-shaped Ometepe island in Lake Nicaragua. The basaltic-to-trachydacitic edifice is cut by numerous faults and grabens, the largest of which is a NW-SE-oriented graben that cuts the summit and has at least 140 m of vertical displacement. The small Laguna de Maderas lake occupies the bottom of the 800-m-wide summit crater, which is located at the western side of the central graben. The SW side of the edifice has been affected by large-scale slumping. 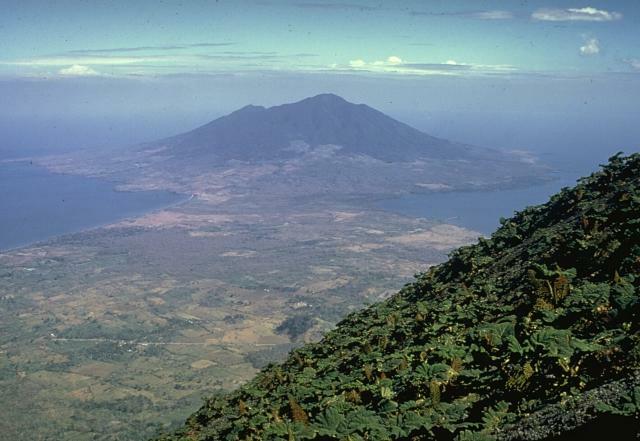 Several pyroclastic cones, some of which may have originated from littoral explosions produced by lava flow entry into Lake Nicaragua, are situated on the lower NE flank down to the level of Lake Nicaragua. The latest period of major growth was considered to have taken place more than 3000 years ago, but later detailed mapping has shown that the most recent dated eruptive activity took place about 70,000 years ago and that it has likely been inactive for tens of thousands of years (Kapelanczyk et al., 2012). A lahar in September 1996 killed six people in an E-flank village, but associated volcanic activity was not confirmed. The Global Volcanism Program is not aware of any Holocene eruptions from Maderas. If this volcano has had large eruptions (VEI >= 4) prior to 10,000 years ago, information might be found on the Maderas page in the LaMEVE (Large Magnitude Explosive Volcanic Eruptions) database, a part of the Volcano Global Risk Identification and Analysis Project (VOGRIPA). There is no Deformation History data available for Maderas. There is no Emissions History data available for Maderas. The Global Volcanism Program has no photographs available for Maderas. There are no samples for Maderas in the Smithsonian's NMNH Department of Mineral Sciences Rock and Ore collection. Large Eruptions of Maderas Information about large Quaternary eruptions (VEI >= 4) is cataloged in the Large Magnitude Explosive Volcanic Eruptions (LaMEVE) database of the Volcano Global Risk Identification and Analysis Project (VOGRIPA).